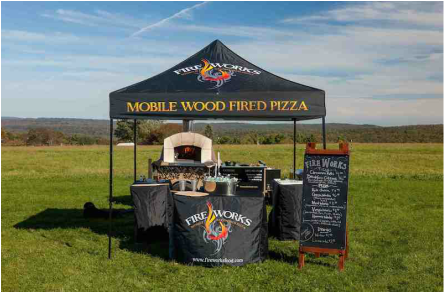 Our mobile wood-fired brick oven is perfect for weddings, wedding after-parties, rehearsal dinners, birthdays, anniversaries, graduations, backyard parties, and corporate picnics. 14-16″ large pizzas are served buffet style and give guests a chance to try a range of toppings. To round out the meal, we have fresh baked starter items like focaccia bread and garlic knots. Fresh salads, oven-baked desserts, and craft drinks are available as well as paper plates, napkins, and flatware. 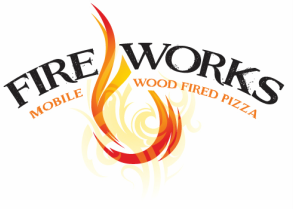 Fireworks uses a Forno Bravo wood fired oven mounted on a specially designed trailer. It weighs about 5,200 lbs and can go just about anywhere. 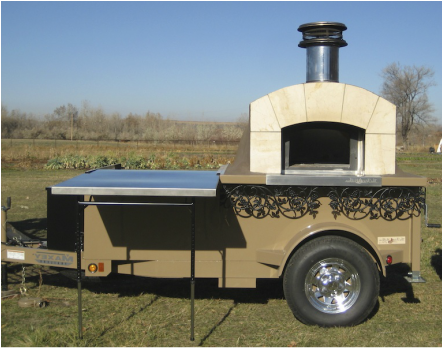 Production capacity is up to 60 personalized pizzas an hour, with each pie cooking in about 90 - 120 seconds. Intense heat ensures a crispy, smoky flavored, thin crust pizza. Cool oven factoid: the top of the hearth opening is ideally 63% of the oven ceiling height. If it's too high, heat is lost; if it's too low, the oven does not heat completely. "Dad, is calzone still a pizza?"